The Sarstoon Temash Institute for Indigenous Management (SATIIM) issued a late evening statement reacting to a decision by the Government to proceed with the public consultation scheduled for next Thursday, October 25, 2012, to discuss a 300-page Environmental Impact Assessment (EIA) submitted earlier this month by US Capital Energy, as they prepare to drill for oil in at least 6 Maya communities in Toledo and inside the Sarstoon Temash National Park (STNP), which SATIIM co-manages. Last week, both SATIIM, and leaders of three Maya communities – Crique Sarco, Midway and Conejo, and one Garifuna community – Barranco, wrote Chief Environment Officer Martin Alegria, to request the extension of the scheduled consultation date to Thursday, November 22 or thereafter. Ch’oc told us that the DOE responded today, saying that the one-month extension won’t be granted. Minister of Forestry, Fisheries and Sustainable Development Lisel Alamilla told Amandala this evening that the consultation, which had been originally scheduled for today, October 18, but postponed after members of the National Environmental Appraisal Committee (NEAC) asked for more time, will proceed as planned next week. There can be no further delay, said Alamilla, because environmental authorities are bound by law to complete the EIA process within a 90-day cycle. The Minister said that the concerned parties can still attend next Thursday’s EIA consultation and state their concerns, and they can provide input on the EIA (prepared by Nextera Environmental and Engineering Consultants under the leadership of Allan Herrera) even after the consultation. 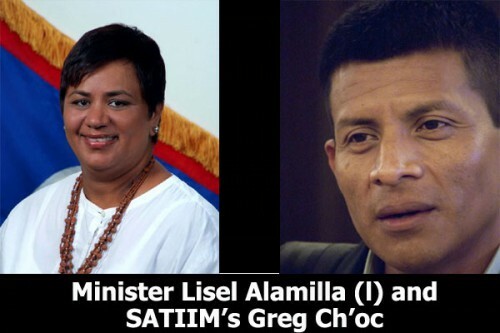 SATIIM said that it considers the refusal to grant the extension to be “an act of bad faith” by the Government of Belize. Crique Sarco chair Juan Choc and alcalde Luis Choj; Conejo chair Enrique Makin and alcalde Eufemio Makin; and Midway chair Jose Paau and alcalde Rolando Paau; as well as Barranco chair John Rodriguez also sent off a joint letter to the Chief Environmental Officer requesting the postponement of the EIA consultation. They said that the communities have no knowledge of the EIA in question and only this week have they been given the huge document—a technical document in English, not their first language. “To effectively participate in this consultation process, they need to understand the content of the over 300 pages of the EIA document which first needs to be translated into their native language – Q’eqchi’,” Ch’oc urged in a letter to Alegria. Ch’oc told our newspaper that when US Capital Energy requested an extension of their seismic testing permit in 2010, even though their permit had expired two months earlier, they were accommodated; so, he questioned, why can’t the Government of Belize accommodate the people of Toledo? Ch’oc told us that if the government persists to ignore the pleas of the people of the South, they may have to resort to court action, to seek judicial review against the government. Ch’oc said that SATIIM was also not aware that US Capital Energy was conducting an EIA for exploratory drilling and at no time was SATIIM consulted during the development of the EIA. By the time SATIIM was asked for input, said Ch’oc, the EIA had already been finalized. He said that whereas the EIA formulation process began in April, SATIIM was not contacted until August. Apart from citing the UN declaration, the Coalition cited the Inter-American Commission on Human Rights (IACHR) ruling in 2004 and the Belize Supreme Court rulings of 2007 and 2010, which, it said, reaffirmed the rights of the 38 communities to meaningful and effective consultation, as well as the right to free and informed consent or the right to informed rejection of any development projects on communal lands. Niall Gillett of NAUTA VERO, the PR firm US Capital has hired for its Belize project, told Amandala when asked if the company is willing to accept a postponement to satisfy the request of the Maya that they will comply with whatever the Government of Belize decides. US Capital was awarded a petroleum contract back in 2001 for 795,678 acres of Southern Belize. The company notes that it has concluded seismic surveys, and it is now ready to proceed with exploratory drilling. Gillett said that they hope drilling could get underway early next year. In its EIA, the company claims that the villages in question, Crique Sarco, Sundaywood, Conejo, Midway and Barranco are all open to oil exploration, but it notes that some are concerned about the regulatory framework and environmental impacts of petroleum exploration activities. It cites the community of Conejo as taking the view that the government should promote oil exploration in Belize, but notes concerns over the current environmental and regulatory framework. US Capital said that it has been operating in the area since 2007. According to Ch’oc, the company plans to drill two wells inside the national park, including within the rare sphagnum moss habitat, apart from further wells in the aforementioned villages.